It's not the meat—it's the heat! 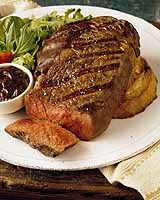 Eating red meat has long been linked with an increased risk of cancer, especially rectal cancer. A new study questions that association. In a U.S. study of 2157 men and women, researchers found no link between eating red meat or white meat and rectal cancer. But when either type of meat was cooked well done, men had a significantly higher risk of the disease. Interestingly, eating red or white meat did not increase the risk of rectal cancer in women, whether the meat was cooked rare, medium or well done. And women who consumed red meat drippings had a lower risk. The scientists concluded that cancer risk comes from substances that are formed when meat is cooked to higher temperatures. Two heat-related compounds, HCAs (carcinogenic heterocylic amines) and PAHs (polycyclic aromatic hydrocarbons) are the main culprits. Eat your meat rare or medium rare, and you may avoid the health risk altogether. Note: For safety, the USDA recommends cooking hamburgers and ground beef mixtures such as meat loaf to 160 °F. However, whole muscle meats such as steaks and roasts may be cooked to 145 °F (medium rare).